Mass masala commercials has no dearth of audience in India. When a mass masala commercial entertainer is backed up by an actor with ease at action and has that believable energy and charm. Tiger Shroff, who made his debut with Heropanti, is now coming with a pure mass commercial entertainer co-starring Shraddha Kapoor and Sudheer Babu, debuting as antagonist in Bollywood, directed by Sabbir Khan. Let’s see how it works on us! Ronnie (Tiger Shroff) is a rebel. In order to set him in the right path and disciplined his father sends him to a Martial arts academy run by his friend. But he don’t change much. On the way to academy he gets to meet hyper chirpy and fascinated by rain, a girl named Sia (Shraddha Kapoor) and falls for her. She is an upcoming actress in her father’s (Sunil Grover) film. Raghav (Sudheer Babu) is the best student of Martial arts academy and son of Ronnie’s teacher is also in love with Sia. His love is more like obsession. When his trials to make Sia fall for him fail, he kidnaps her to Bangkok. How Ronnie saved her from Sia? forms the rest of the story. Tiger Shroff is in terrific form with his second film. He acts with a style. His action sequences and dance forms are delight to watch on screen. Shraddha Kapoor is superb. But her charcter has some resemblances with her character in Ek Villain. Sudheer Babu is outstanding as Raghav, who is in obsession of love. He is definitely a gem in the form of a villain. Sunil Grover is adequate. Other actors did accordingly. Story of the film is said to be modern adaptation of epic Ramayana. Screenplay is good and entertaining in first half ang okay in second half. Dialogues are good. Songs composed by various composers like Meet Bros, Amaal Malik, Ankit Tiwari, etc are nice and are well received when they are released. Background score by Julius Packiam is good. Cinematography by Binodh Pradhan is nice. He captured locales of Kerala and Bangkok very nicely. Editing by Manan Sagar is good. But he should have given extra effort for the second half. Stunts and action sequences are very well composed. Production Values are nice. Baaghi which is said to be the love story of rebel, Tiger Shroff is introduced as a rebel by whom his father is angry at anything he does. The very first fifteen minutes of this movie are very racy and well written with a gripping screenplay. First half is filled with some solid action sequnces and humorous scenes. It ends with an interesting block but predictable. First half is the crux and best of this movie. It is entertaining as well as engaging. It is the second half which spoils the movie. Ronnie becomes the only saviour, who can save her from the arms of Raghav fighting a building full of Raghav’s henchman. Second half has nothing but martial arts sequences which seem to be lifted from The Karate Kid and other martial arts movies. Tiger Shroff has all the qualities to become a star. He has a terrific screen presence and his fights out the villain believably and with ease. Sabbir Khan, who introduced Tiger Shroff did a nice job with this movie. He focussed more on action sequences this time, it seems. He should have taken care of logics which are missing from the very first scene itself. 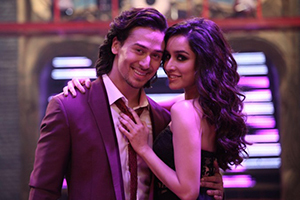 Baaghi is a tailor made commercail entertainer for Tiger Shroff and best debut for Sudheer Babu into Bollywood. Watch it if you are lover of mass masala commercial entertainers. Tiger got engaged to Disha?